A victim or a named party to the case. An attorney, an authorized agent, or insurance representative. An attorney or authorized agent must include a signed authorization from the involved party. An authorized agent must also include a copy of the involved party’s identification. An insurance representative should reference the name of the insurance company and the insured party’s information. 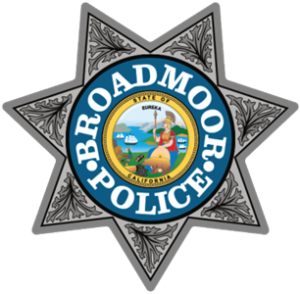 Note: The Records Division is located in the Police Department at 388 88th Street, Broadmoor CA 94015. You may obtain help in person by entering the building through the Police Lobby (Monday – Friday 7:00am – 3:00pm). 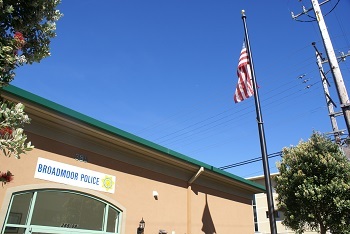 To contact police personnel after hours or if the lobby is closed for business, there is a yellow call box to the left of the lobby door that will connect you directly to the police dispatch center. The California Public Records Act (the “Act”) was enacted to ensure public access to public records. You may request copies of specific information or materials and the District will provide this information, or an explanation of why it cannot be disclosed, as soon as possible consistent with the Act. After submitting, please wait for a call from department staff with instructions before coming to the station. The fee for reports is $10. Payments can be made by Cash (exact amount) or Credit Card. No checks are accepted.